The J/109 was originally developed as a one design cruiser racer and one of the principal attractions of the class for many is the opportunity to race head to head against each other in equally matched boats, with victory going to the boat first to cross the line. In order to compete in One Design events, competitors must be members of their national Class Association and comply with the current Class Rules. The class rules aim to keep the boats equally matched by specifying the maximum size and number of sails that can be used in any regatta and requiring the boat to be equipped according to the original specification. The rules also limit the total weight of the crew (excluding the owner) to 600kg although this is relaxed for certain regattas like Cowes Week in order to encourage the participation of the whole family in the event. The requirement to get more than 6 or 8 J/109s to the start line in compliance with the class rules for a One Design event can be a challenge, particularly away from the Solent which has the greatest concentration of active J/109s. Consequently, many J/109s participate in handicap racing under IRC, a rating rule used to handicap different designs of keelboats allowing them to race together. In order to compete in an IRC race, a yacht need not comply with the J/109 UK & Ireland Class Rules, but does need to be in possession of a valid IRC Rating. The process need not be complicated and is described best by the rating office themselves here. The J/109 is an approved IRC one-design and there is a simplified rating approval process for a J/109 set up in compliance with the class rules. Such a boat is likely to obtain an IRC rating in the range 1.021 to 1.023. A J/109 is competitive in this configuration, but many chose to reduce their sail plan, restricting themselves to non-overlapping jibs rather than using the class overlapping genoas. Restricting the sail plan in this way can achieve a significant reduction in the rating to as low as 1.006 or lower depending on the maximum size of jib specified. Performance of these smaller jibs can be improved by the use of in-haulers and replacing the furling head foil with a fixed tuff luff. A J/109 in this configuration will suffer only a minor speed reduction in certain conditions vs. one in one-design configuration, but will rate considerably less, so will have an advantage in an IRC race when it’s corrected time is calculated based on its lower rating. However, it is very important to remember that a J/109 rated for non-overlapping jibs may not use larger, class sails than allowed by the current rating certificate when competing in an IRC race on this rating. Similarly, a J/109 may not currently use in-haulers or remove the furling headfoil in favour of a tuff luff when competing in one-design class racing. As participation in IRC racing by J/109s has grown and the advantages on the IRC rating of reducing the sailplan been greater appreciated, many owners of J/109s have found themselves needing to maintain two different sail inventories in order to compete one weekend in one-design racing and the next in IRC events. As a result, the class has agreed to amend the rules governing one-design racing enforcing a switch from overlapping Genoa’s to non-overlapping jibs, allowing in-haulers to sheet the jib further inboard and adding the flexibility to hoist the jib on a fixed tuff luff or to use the existing furling headfoil as each boat chooses. The objective of the change is to bring the configuration of the boat used for one design racing much closer to the configuration considered by most to be optimal for IRC handicap racing, which will make it simpler and potentially less expensive for boats to participate in both disciplines. The changes will come into force for the season commencing 1st January 2021, allowing those that have invested recently in new overlapping class sails to use those sails for the next two seasons and replace with non-overlapping headsails as the replacement cycle dictates. After that date, overlapping genoas will no longer be permitted for one-design racing. 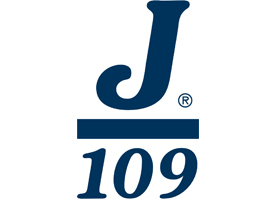 From 1st January 2019 until 1st January 2021, J/109s will be permitted to race in one design class events with either overlapping or non-overlapping headsails as they chose. The Class Rules 2019, available from the Documents section on this web site, detail the arrangements for sailing under either configuration during the transitional period.